Velvet interiors are rare to find especially in recent years. Though in 2018, it is having a come back, being named one of the top trends for winter! There are ranges of ways you can go about this trend. 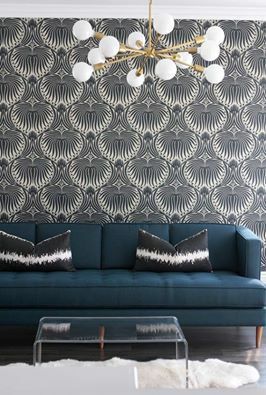 You can have minimal decor that is velvet like pillows or blankets and or you can have a big focal point in that material as a sofa or lounge chairs. 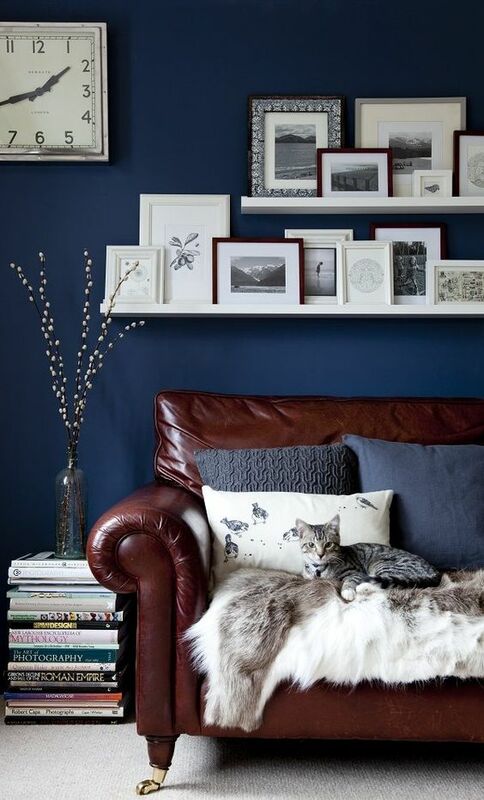 Here is a perfect example of how minimalistic you can get with your velvet decor. Here is a perfect example of how you can use velvet to its greatest potential, as a focal point with a piece of furniture. 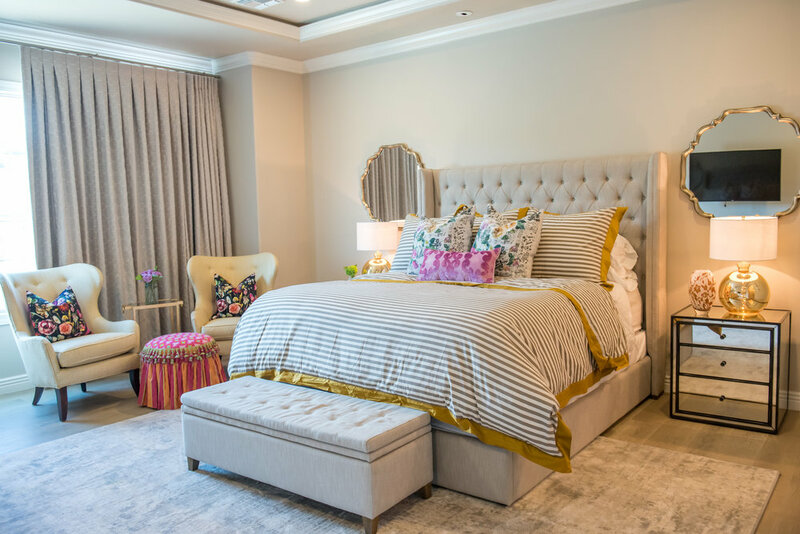 When deciding when how you want to include velvet into your space, not only can you think of quantity but you can also think about color, ranges and ranges of colors!! From soft to vibrant, cool or warm tones, the options are truly endless. After deciding what your color vibe is and thinking if you are more of a minimalist or want to wow your guests, you can also think about what specific space you want to display your pieces. You want them to show in a formal, classy area like a dining room, living room, bedroom, etc. Now when “the options are endless”, keep in mind you don’t want to overwhelm your space with too much. Organize it in a classy fashion so its not all clustered together. Velvet give a sense of warmth and luxury into a space which is perfect for the holiday season! With all this being said, find your comfort level and happy decorating to bring that splash to the end of the year! The new trend going around town is feature walls, a more bold effect to the term accent walls. Usually when you hear “accent wall”, you think of a different wall being painted a different color then the rest. In this case, we are talking about bold, big format wallpaper. Whether your style is simplistic or you want to make your guest gasp (in the best way! ), there are so many options for you. With the designs being endless, the most popular images are blown up flowers , or anything in the natural aspect, geometric shapes, abstract water color looks and textures. 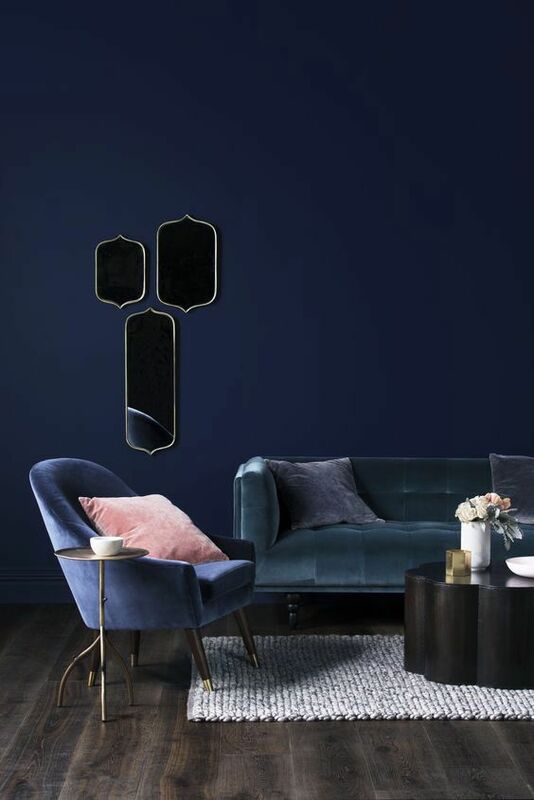 Feature walls are to not only make your guests remember the design surprise, but to also make your home or room feel unique to your personal style. 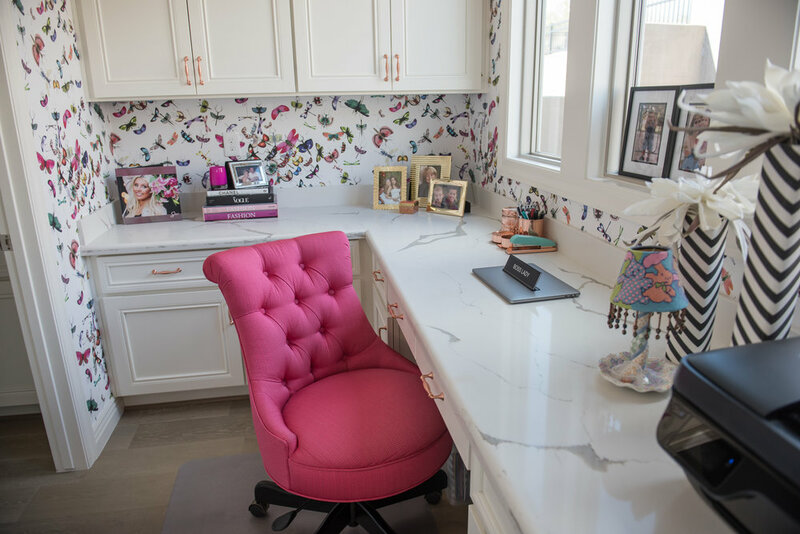 Having plain painted walls is the usual way to go if you aren’t fond of bold patters, but bold patterns and fun wallpapers bring a whole new personal aesthetic to your space that can change a lot. Change to the design world and a twist to the term “accent wall". When we think of Fall colors we think of oranges, mauve, reds, the dark rustic colors. Well according to this years interior design predictions, this fall calls for the dark values of the cool colors. Navy blues are the rage this year. If you really think about it, the dark cool colors make you feel nice inside just like the warmer tones. Whether it is an accent wall of paint or pieces of furniture, you can incorporate this fall trend anywhere or however you would personally like. With color and interior design there is really no limit to how much you use a specific theme to your space. You can still use a lot of one thing, spreading it all out is what makes a room not look overflowing. Here in the very warm summer desert, we don't get the pleasure of feeling a "tropical breeze". How we can incorporate the tropical feel into a desert home is spice up the walls or the decor. A summer trend for 2018 , for interiors has revolved around the tropical leaves and their nature, bright colors. Wallpaper is always a great way to incorporate that vibe of being in a tropical oasis. When trying to make a room feel like the trends feel but not wanting to overload it, you can add decor in different parts of the room as well. When all is done, grab a drink , a good book and press play to your tropical Pandora station! Summer brings its bold flavors, sights and sounds, along with vacations vibes. This year, we’re noticing bold color is along for the adventure. Summer time here in Arizona can have a mixed effect on people with the weather but what everyone loves about it are all the bright and vibrant colors associated with the season. The color palette with this season in design would consist of vibrant oranges, yellows, blues, greens and the list can go on. Arizona is known for its bright sunshine and hot weather, so what better way to show that in an interior with all the yellows! We are cactus central when it comes to landscapes so, mixing that feature with the colors is a perfect representation of a ‘sizzeling’ design. In design there are always new trends popping up every year, sometimes even more than one in that year. Keeping it neutral is always someone’s ideal want for a home but you have to add a chromatic touch to spice up the place. How we emphasize that look is, keeping the main pieces in the neutral colors like white, beige, etc. Having the main, big pieces like this makes it easier to go through the years and seasons without having to change the “big picture”. Adding in the colors is what makes a space fun and have its own personality to it. With that being said, we add the colors in the accessories. These include pillows, rugs, drapery, and other objects that might have meaning to the area but also the client. Pushing the boundaries when it comes to colors and patterns is acceptable because there are endless combinations out there. But with breaking the boundaries comes with a very important boundary where using a lot of color and accessories, there needs to be a sense of flow, but also comfort with in the living space. After a long day, there’s nothing better than having a long soak in the bath. Naturally, you want this part of your house to be as inviting as possible, so is it time that you gave your bathroom a revamp? Whether you’re hoping to create a tile effect without the weekend-long effort, or simply add a splash of color; Graham & Brown’s beautiful range of wallpaper is easy to apply for instant transformations. From a practical standpoint, if you’re worried about the state of your walls, why not check out their tips on handling damp first? This may be a wet room, but you’ll want to ensure your walls are nice and dry before you decorate - only then can you let your creative juices flow. Add depth to your bathroom interior with Seafoam textured wallpaper. 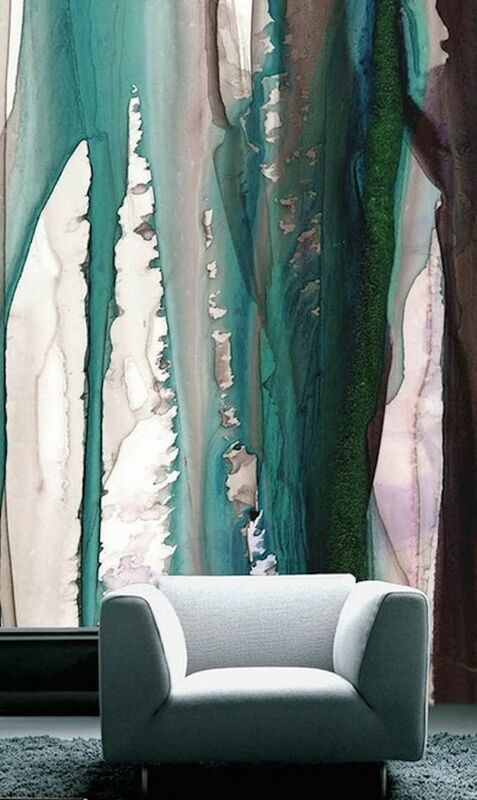 Paintable to offer an extra touch of customization, these flowing waves create a calming atmosphere that entices the weary to wash away their woes. Let these textured swirls flow down your walls, leaving behind subtle shadows as they go, whether you choose to coat this in a color of your choice, or leave it white for a clean finish. 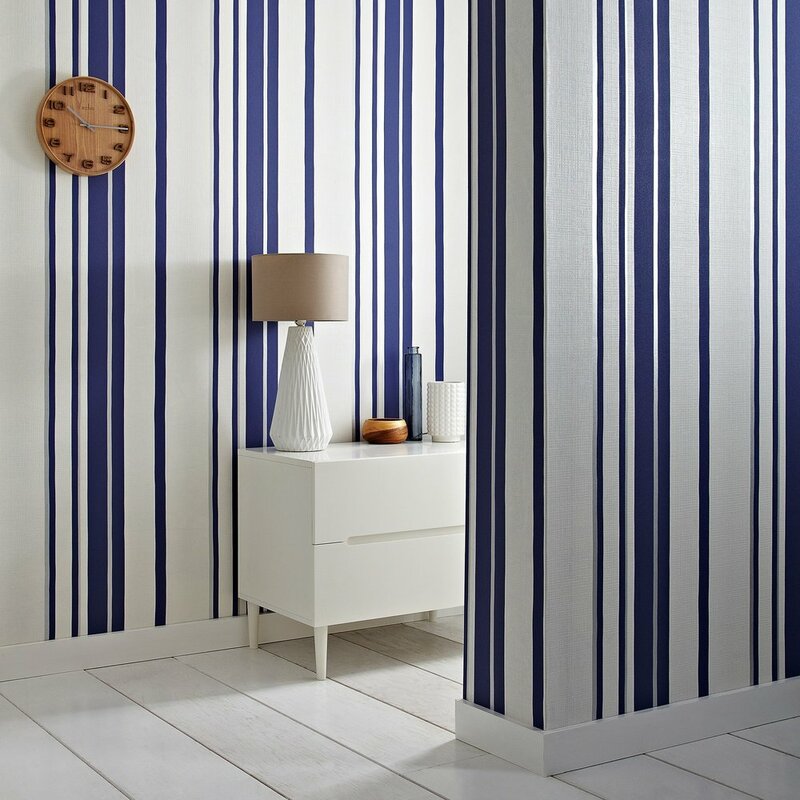 This chic Hoppen Stripe wallpaper from esteemed designer Kelly Hoppen gives your bathroom that distinctive nautical theme with a quirky twist. With a crisscrossing flannel effect on each white panel, this textured wallpaper boasts more than just a stylish color palette. Shimmering silver streams break up the contrasting navy and white to update this traditional trend. If you’re looking for a clean tile finish, but don’t have the time for meticulous mosaic making at the weekend, the Checker Blue/White wallpaper which makes for an excellent, easy alternative. Forget cleaning moldy grouting for the foreseeable future, this fantastic design looks just like the real thing and stays clean and hygienic. Its simple color palette makes it perfect for color coordination and each subtle blue accent gives the sense of pixelated bathtub waves. For an even more glamorous alternative to traditional tiling, the Sparkle Black wallpaper brings an aura of sophistication to your bathroom. Instead of hard-to-clean grouting, each tile effect block is separated by a stunning glitter lining that gently twinkles against any light. Set up the candles and watch from beneath the bubbles as the flickering light catches the glittery elements, illuminating your bathroom like the night sky for a magical feeling of relaxation that will make you feel out of this world. Some people think it’s not practical to wallpaper a bathroom, but this couldn’t be further from the truth. In fact, applying wallpaper is easier than painting on to bare plaster and it’s certainly far less arduous than retiling. **This post brought to you by Graham & Brown. Check them out! !